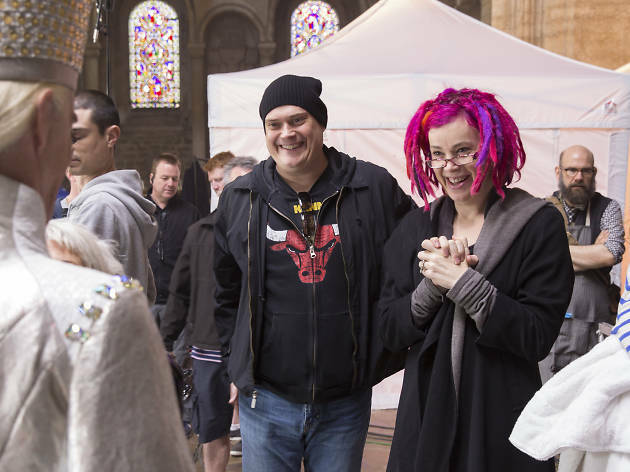 With their new film ‘Jupiter Ascending’, sibling writer-directors Lana and Andy Wachowski have pulled off something increasingly unusual in modern filmmaking: a big-budget sci-fi adventure that isn’t adapted from a comic book or TV show but springs directly from their own out-there imaginations. Bursting on to the blockbuster scene in 1999 with their second film, ‘The Matrix’, the Wachowskis have consistently proved to be daring, subversive voices in mainstream cinema. And while films like ‘V for Vendetta’ (which they wrote and produced), ‘Speed Racer’ and ‘Cloud Atlas’ may not have followed the early success of their ‘Matrix’ trilogy, their movies could never be mistaken for the work of anyone else. This sense of existing outside the norm looms large in their personal lives, too: Lana (born Larry), 49, is the only openly transgender director in the American film industry, and has spoken proudly about the difficulties associated with coming out. On the phone from Chicago, Lana is by far the more expressive and outgoing of the pair, while Andy, 47, finds it harder to hide his distrust of critics and interviewers. But they’re equally enthusiastic about their work, and the sheer joy they take in making movies. You’ve been in the film industry for more than two decades. How have the changes you’ve been through personally affected the stories you want to tell? ‘Jupiter Ascending’ harks back to ‘The Matrix’, the story of an ordinary person who turns out to have extraordinary powers. What appeals to you about messiah stories? How do you explain your huge success? There are lots of kids who grew up with role-playing games, but they didn’t all become massively successful filmmakers. Is your sibling bond an important part of it? There seem to be a lot of filmmakers in a similar position – the Coens, the Dardennes. You don’t get that with firemen or doctors. You must have creative differences, though. How do you resolve them? In your last few films you’ve worked a lot with make-up. How does an actor like Channing Tatum, who plays a genetic hybrid wolf-man in ‘Jupiter Ascending’, deal with all those hours in the chair? Channing Tatum’s character feels like the most straightforward action hero you’ve written. What was the thinking behind that? How hard is it to get a completely original script made in Hollywood nowadays? ‘Jupiter Ascending’ opens in UK cinemas on Fri Feb 6.